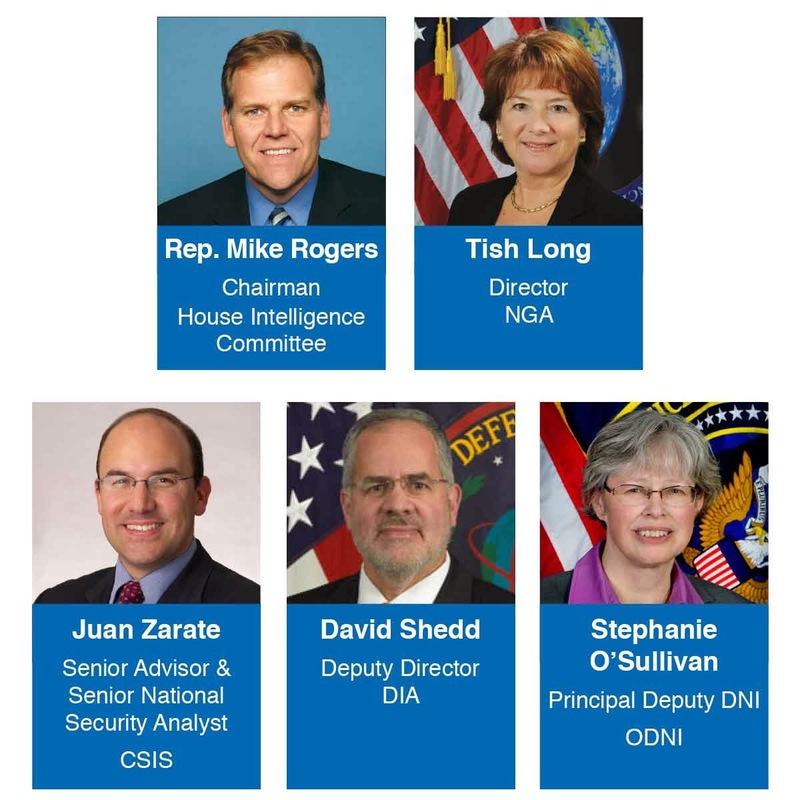 Mike Rogers serves as the Chairman of the House Permanent Select Committee on Intelligence. The Committee is the House’s primary panel responsible for authorizing the funding for and overseeing the execution of the intelligence activities of the United States government. Tish Long was appointed Director of the National Geospatial-Intelligence Agency August 9, 2010. Prior to her appointment, Ms. Long served as the Deputy Director of the Defense Intelligence Agency from May 2006 until July 2010. Previously, she was the Deputy Under Secretary of Defense for Intelligence (Policy, Requirements, and Resources) from June 2003 until May 2006. She also served in the positions of Deputy Director of Naval Intelligence from July 2000 to June 2003 and the Director of Central Intelligence’s Executive Director for Intelligence Community Affairs, responsible for community-wide policy formulation, resource planning and program assessment and evaluation between January 1998 and June 2000. David Shedd was named Deputy Director of the Defense Intelligence Agency in August 2010. In this capacity, he assists the Director’s management of a workforce with more than 16,500 military and civilian employees worldwide. Stephanie O’Sullivan was sworn in as the Principal Deputy Director of National Intelligence (PDDNI) on February 28, 2011. As PDDNI, Ms. O’Sullivan serves in a role similar to that of a Chief Operating Officer where she focuses on the operations of the ODNI, and manages Intelligence Community (IC) coordination and information sharing. She also reinforces the DNI’s intelligence integration initiatives and focus on IC resource challenges. Before this assignment she served as the Associate Deputy Director of the Central Intelligence Agency (CIA) since December 2009, where she worked with the Director and Deputy Director in the overall leadership of the Agency, with emphasis on day-to-day management of the organization.